For centuries, people have wondered what causes the Bermuda Triangle to exist. The mysterious Bermuda Triangle known as the Devil's Triangle is blamed for boat, ship, and airplane disappearances. Said to be located between the Straits of Florida, San Juan, Puerto Rico and Bermuda, the Bermuda Triangle is in one of the busiest waterways in the world. There are countless theories and speculations surrounding the causes of various disappearances within the perimeters of the Devil's Triangle. Most theories have some evidence to back them up, but they are far from proven. Understandably, without any scientific proof to substantiate claims of paranormal or supernatural causes, the United States Coast Guard doesn't recognize boat or ship disappearances as anything more than normal seafaring risks. However, that doesn't mean there isn't a logical explanation for the phenomenon. The Bermuda Triangle encompasses one of the deepest underwater trenches in the world. This is an important point to consider when examining possible causes for ship and boat disappearances. Deep trenches are notorious for causing whirlpools that can be very dangerous where churning waters can pull a ship underwater. Trenches can trap the water and make the whirlpool more powerful and larger. 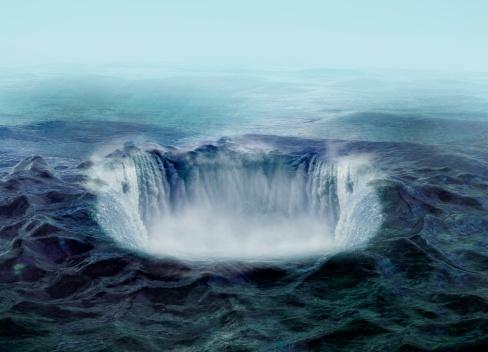 In his book, The Bermuda Triangle, Aaron L Rudolph writes that the ocean floor often has quicksand and deep trenches. If a wrecked plane or ship falls into either of these, he explains that it would be almost impossible to find. Another possible cause of some disappearances might be the sudden and unpredictable weather patterns found in the Bermuda Triangle. According to UCSB Science Line, the convergence of the Caribbean Sea, Atlantic Ocean, and the Gulf Stream can create very turbulent waters. The mixing of warm and cooler waters along with strong currents generates sudden powerful storms. Another contributing factor is that many of the boats attempting to cross these waters are too small to withstand some of these powerful seas. Additionally, there is the inexperience of some of the boaters venturing into the triangle. Another popular theory to explain sudden disappearances of ships and possibly low flying aircraft is methane gas release. The theory postulates that trapped pockets of methane gas suddenly released can rush to the surface like huge bursting bubbles and capsize a ship. Scientists have conducted tests in laboratory tanks and demonstrated that this is a strong possible cause for mysterious disappearances of ships. However in 2017, physicist and oceanographer Helen Czerski at University College London claims the methane bubble theory doesn't hold water. In a YouTube video, she demonstrates that the methane gas release would quickly turn to tiny bubbles, not powerful big bubbles. In fact, she states that the smaller bubbles might pitch a ship up, never down. Aside from rocking the ship, the gas release would cause a big stink, but certainly would not capsize a boat or ship. Her research seems to disprove the often accepted large bursting bubble theory. Caribbean pirates might not belong just in the history books or Disney movies. It's not unreasonable for a portion of the unexplained disappearances to be the result of modern day pirates. The Travel Channel cautions that the US Department of State warns, "against the possibility of encountering, 'vessels...engaged in illicit activities…near the Bahamas.' "
This warning lends credibility to the theory that some of these disappearances are the result of marauding criminals. The passengers/crew are either killed or sold into slavery while the boat is stolen and possibly sold. According to a New York Times article, there are "tens of thousands of boats or ships stolen around the world each year...." These ships become part of a global crime fleet known as the Phantom Fleet. In the Caribbean, the ships are mostly used to smuggle guns and drugs. Surplus ships and boats are sold on the black market to further fund the fleet's criminal activities. It's easy to see how stealing a ship or boat in such vast waters plagued with a history of unexplained disappearances would attract such a crime organization. Don't confuse a rogue wave with a tsunami, which is caused by an earthquake. The conditions for a rogue wave are deep water and strong currents. With the introduction of satellite imagery, the scientific community no longer denies the existence of freak waves. In 2000, a British oceanographic research ship encountered a 61-foot rogue wave. It measured individual waves up to 95 feet high. In addition, the European Space Agency satellites have recorded ten rogue waves that were 82 feet high and higher in some instances. Warm water oceans can spawn sudden waterspouts, tornadoes, water cyclones, and hurricanes. Before weather monitor satellites and radar, there were very few warnings of such emerging storm fronts. Waterspouts can appear out of nowhere and disappear as quickly as they were created. Many believe this kind of natural weather condition is responsible for those disappearances that weren't caused by human error. One of the more recent theories behind the Bermuda Triangle disappearances blames hexagon shaped clouds that create 170mph air bombs. The Mirror reports scientists discovered that these hexagon clouds, often ranging from 22 to 55 miles in size, can create winds strong enough to toss planes from the sky and flip over ships. To compound the problem, as the air bombs strike, the winds also generate up to 45-foot waves. The strange disappearances and eyewitness accounts of those who've survived inexplicable occurrences often refer to these experiences as paranormal or supernatural. They describe such things as compass needles whirling about, loss of time and other bizarre, out-of-the-normal seafaring experiences. With no concrete proof to back up natural phenomena theories, many accept the triangle's mysterious nature as being paranormal or even supernatural. This theory contends that the magnetic fields are somehow disturbed and then affect the navigation systems on boats and planes. This theory had little traction among scientists with no real life example, but that changed when it was discovered that what's known as the equatorial electrojet reacted to shock waves from solar winds. A Mother Nature's Network article describes these electromagnetic anomalies discovered occurring over the Earth's equator. The equatorial electrojet is explained as a "narrow ribbon of current flowing across the equatorial region of the Earth's ionosphere." This reaction demonstrated to scientists that Earth's magnetic field has a few spots that are weaker than the overall magnetic field. These areas are suspectible to magnetic storms that in turn can manifest in geomagnetic storms. Whether such storms could reach the Bermuda Triangle remains to be seen. The theory that one or more black holes are located in the Bermuda Triangle isn't new. In 2013, the Daily Mail reported scientists had discovered a black hole in the southern Atlantic Ocean. The article states, "These huge ocean whirlpools are so tightly surrounded by circular water paths that nothing caught up in them escapes." The scientists confirmed these whirlpools were mathematically identical to black holes. In the book, Anti-Gravity and the World Grid edited by David Hatcher Childress, 20 magnetic gravity points are discussed. The book contends that being in the Bermuda Triangle on the wrong day could send a boat or plane and its occupants into space some 20,000 to 75,000 miles. The book describes the Bermuda Triangle as a "powerful diamagnetic levitator" whenever it becomes active. Edgar Cayce's reading on the Bermuda Triangle told about a huge laser crystal that was a powerful weapon that was also used as the guiding energy source for Atlantean aircraft. Cayce said the crystal was submerged underneath the water of the Bermuda Triangle. He stated that on clear days when the water was calmer, the sunlight hit the crystal and activated it. The crystal beam disrupted electronic equipment and was responsible for the disappearances in the Bermuda Triangle. There have been a few reports of loss of time by those lost in the Bermuda Triangle who survived to tell their stories. In one such case, Bruce Gernon, an instrument-rated flight instructor, was flying from Andros Island to Ft. Lauderdale. He encountered bad weather and flew into what he described as a tunnel. He claimed to time travel, since he arrived in Ft. Lauderdale nearly 30 minutes early, having used nine gallons less fuel than normal. The pilot co-authored a book about his experience, The Fog: A Never Before Published Theory of the Bermuda Triangle Phenomenon. Christopher Columbus is said to have seen strange dancing lights along the horizon of the Bermuda Triangle. Supposedly, he later saw a round glowing object submerged in the ocean. In addition, Columbus reported how on two occasions the compass reading was NW at night, but by daybreak it corrected itself to align with the North Star again. There are many similar stories about people seeing UFOs and USOs (Unidentified Submerged Objects) within the Bermuda Triangle. Some theorize that UFOs are using vortexes or wormholes to enter and exit our world, and somehow ships and planes also go through these passages. 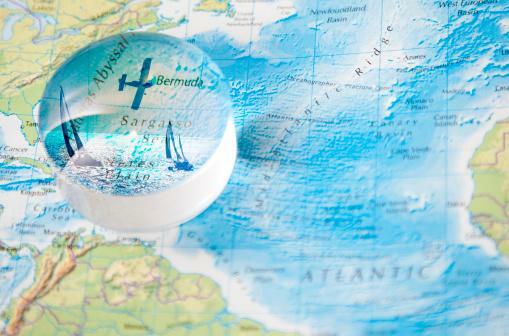 The mysterious Bermuda Triangle remains an icon of speculation. Whatever you decide to believe, one thing is certain; there are many theories used to explain the causes of the numerous disappearances in this fascinating area of the world.